I am one of those people who should just go ahead and book my Valentine’s Day table for White Castle. Growing up on the south side of Chicago like I did, with several WCs close by, it was a definite staple of my teenage diet. I live on a different side of the city now, but I still know where the closest White Castle is (Addison and Kedzie). 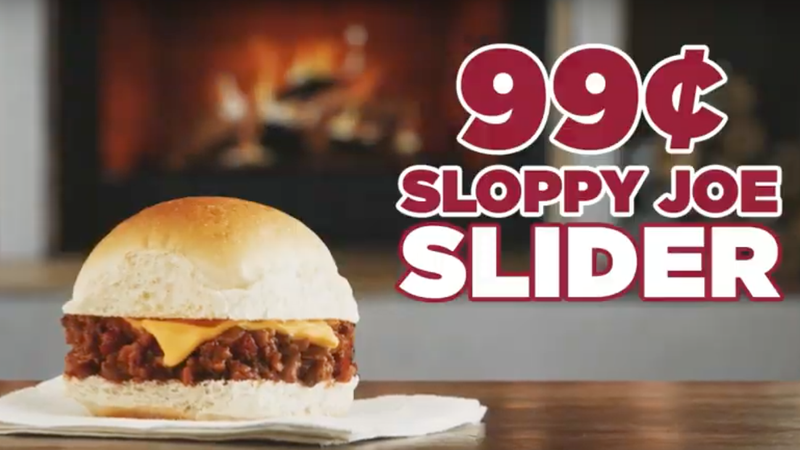 And I was driving right by there on my way to the Target when I saw the sign announcing the 99-cent Sloppy Joe Slider. I also love Sloppy Joes. I also was starving. So I hit the drive-thru for two of these unfamiliar sandwiches, with total bill of $2.27. I ate the meatballs and pesto with plain Greek yogurt and toasted pita. And wine.